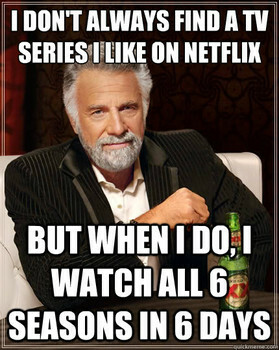 As you may expect, I am one of the numerous people who has spent endless hours watching Netflix. From watching countless episodes of a show until 2:00 a.m., to ignoring plans to watch a show, I have experienced my fair share of the affects of Netflix binge-watching. Due to this, I decided to research the science behind this, because I truly hope there is a justifiable reason as to why I watched all 121 episodes of Lost in ten days, and all 125 episodes of Parks and Recreation in a mere two weeks. Apparently, there are various reasons behind the science of binge-watching. According to ThriveWire Contributor, one reason is due to the fact that we perceive watching television as a task. Naturally, as we finish a task, our body releases dopamine. Dopamine is the control center for rewards, so we innately want more of this. One way of receiving more dopamine while still watching Netflix is to finish the series of that show. In another discovery, it was also found that during the night, bright lights increase our serotonin levels (Thrive Wire Contributor 2015). Serotonin is a mood stabilizer, so again, naturally, our bodies want more of this. This would explain why so many of us binge well into the night, opposed to binging during the daytime. Going off of this, in a recent pop quiz, we learned that light during the night led to signs of depression in hamsters. One question on the quiz asked if people should avoid light at night too, causing different opinions among people in the class. Although the general consensus was that we should in fact turn off the light to avoid these signs too, maybe we shouldn’t if this light increases our levels of serotonin. Moving on, due to recent realizations of the neurological reasons as to why we binge-watch, writers have taken this into account and have written episodes with the knowledge that we will most likely watch/want to watch more than one episode at a time. In other words, writers create episodes similar to how a book would be considered a page turner. They do this by filling episodes with a lot of action, high levels of intrigue, building storylines, and ending with plot twists (Holloway 2015). Here it is clear that although scientifically our brain has reasons for binge-watching, television show creators have manipulated their strategies to even further our need/want for binge-watching. Even though at 2:00 a.m. it may seem impossible to stop watching a show, there are some helpful ways to break your habit. For example, doing something unrelated to Netflix such as simply talking to someone, or going on your phone can help create context to real-life, opposed to life in the world of the show you are watching (ThriveWire Contributor 2015). Another tip is in relation to the recent popularity of cliffhanger endings. Michael Hsu suggests that you watch only a part of the next episode to clear up and gather answers to the previous episode. From only watching part of the next episode, you are able to get answers before getting dragged into another storyline. In conclusion, there are in fact neurological reasons as to why we binge-watch Netflix, so there’s no need to feel bad about yourself the next time you’re up late at night unable to stop watching a show. If in fact you do feel bad though, there are still ways to help stop your binge, so don’t worry too much. This entry was posted in Uncategorized on September 9, 2016 by M.
Binge watching Netflix really resonates with me and I know that it should but they shows are just so good. This post got me thinking about two different things. The first is that tv changes as you age. What I am talking about is the fact that when I was younger I can remember watching things on Disney and Nick and it was much different fro that of TV I watch now. For instance when I used to watch SpongeBob the story line never built off of the past show there was always some new topic or adventure under the sea. I just wonder why it is that many children’s show seem to be very different from the action filled shows I now watch on Netflix? Why is it that those show never build off of one another. The second thing I wanted to talk about is the fact that I think those people who write shows today are changing the way they right to be more like an ongoing story in order to keep you engaged. This allows them to gain more profit and I think that the same can be said for movie producers. The amount of movie series that seem to be coming out, now a days is way more than that of ten years ago. I think that it is very possible that those who are profiting off of college students and many others alike are aware of the scientific implications of the way they write their show. So next time I’m binge watching a Netflix series I think that I will be forced to think about this and what it means to me. I never realized after reading this how much netflix I watch. I can relate to the binging very well. It was just a few months ago where I was telling myself I wouldn’t be the kid to watch a whole series in less than a week and look at me now. Im an avid Narcos watcher, BMS, and many more that I’m not proud of. Last year I took a psychology class in high school and we talked about how netflix effects dopamine levels and releases a certain amount of serotonin. hereis an article about the negative impact binge watching netflix does to you. I used to binge watch netflix shows all last year and through the summer and never wondered why I wasted so much time doing so. It makes me feel better knowing there is a science behind it and i’m not just crazy. I thought I was going to be doing the same thing here at Penn State but I feel like there just isn’t enough time and by the time i’m in bed I just wanna go to sleep! I have read a few posts about binge watching and I felt that this one best used scientific facts to explain why we may be so inclined to spend hours on end watching a show. The part that caught my attention the most was the argument that task completion causes a release of a satisfying dose of dopamine. I must admit that there are times when I am striving to finish a show that I am not even overly fond of, and I think that this idea of task completion presents a very compelling explanation for that. Like many other people I find myself watching Netflix well into the night and I never really knew why I could not stop watching it. I always thought that it was just because I loved the show I was watching so much. That might be the case along with what you stated in your article. When I took psychology last year I learned about dopamine and it never clicked in my mind about watching Netflix until now. I am not going to lie, I do feel very accomplished when I finish a show, but not when it is very late at night. Here is a cool article that I found about how having a Netflix addiction. This post was obviously very relatable to me so I found it very fun to read. Its good to know that there is actual science behind binge watching and i’m not just some addicted freak. Ive heard a lot about the chemical dopamine and how is makes us feel better and i cant believe it relates to this as well. I also didn’t realize that they specifically manipulate the shows so that we will get addicted. Never knew there was science behind screen writing, but it all seems to make sense now. I should definitely try out some of those tips to help me break away from binge watching at night so I can actually get some homework done! while were on the topic though I thought I would post this… click here! Hi Melissa! This blog really caught my eye, especially because I’ve always been curious as to why it’s so hard for me to pull away from a Netflix show after a particularly dramatic episode. I never realized there may be a science behind it, but as we learned in class there is honestly a science behind everything. I actually found this informative video from CNN that presents the argument against binge watching. It states that pausing and taking the time to process each episode of a series can actually satisfy a person more than if he/she watches an entire season/series at once. I personally don’t like binge watching, as I am a person who gets easily bored by watching too much of the same show at once, but doesn’t have the energy to start viewing multiple shows at a time. I can’t argue that I don’t see watching a show as some sort of task, because I do…and I always feel so accomplished when I finish! I really enjoyed your post and found it very relatable. I never thought about why I tended to binge watch later in the night as opposed to day time, but what you said makes so much sense. I like how to used outside sources throughout your blog to establish credibility. Your blog post really caught my eye, especially since I am an avid Netflix binge watcher as well. I watched all of Parks and Rec in a matter of weeks, which probably wasn’t the best idea since it was also during my finals week. I can definitely see how watching Netflix can be perceived as a “task” to our brains, and the release of dopamine while doing so accelerates our will to continue watching and “finish it”. The writers of popular TV shows have definitely taken into account the audience’s neurological response to watching shows, especially with cliffhangers! Perhaps there is some correlation between our neurological responses and the will to keep on watching? Or maybe it’s due to confounding variables such as boredom, intrigue, or simply wanting to join the bandwagon.